You may have thought that X-Men: Days Of Future Past was absolutely over-stuffed with mutant characters. But for comic readers, that's not at all true. In fact, there's always more room for an extra mutant or two. What you may not know, however, is that X-Men: Days Of Future Past actually tried to sneak one more in, if the latest leaked concept art is to be believed. Above is the character design for Jubilee that went unused in X-Men: Days Of Future Past, which was posted online on the blog run by costume designer Phillip Boutte Jr. His resume so far includes Man Of Steel, The Wolverine, Cabin In The Woods, Ender's Game and many many more recent blockbusters. Though it's not listed on his IMDb profile, the blog also seems to feature designs used for Agents Of S.H.I.E.L.D., so the guy knows his superheroes. Disappointingly, he was ordered to stick to plain black leather when putting together Jubilee's look, so we lose her distinct multi-colored mallrat look that for many fans defined her character as one of the youngest and most audience-friendly X-Men (not to mention a fan-favorite from the '90s animated television show). It's also interesting to note that it looks like Jamie Chung was used as a model for the costume. It's a bit of fun, impressive universe-building to include her, but jeez, give her SOMETHING to say. "Hey Xavier, look out!" "Hey Colossus, I made brownies!" "Magneto is our enemy!" "I'm a huge Boston Legal fan!" I don't know, something. In the comics, Jubilee is one of many strong, capable female character that the movies have marginalized and/or ignored. 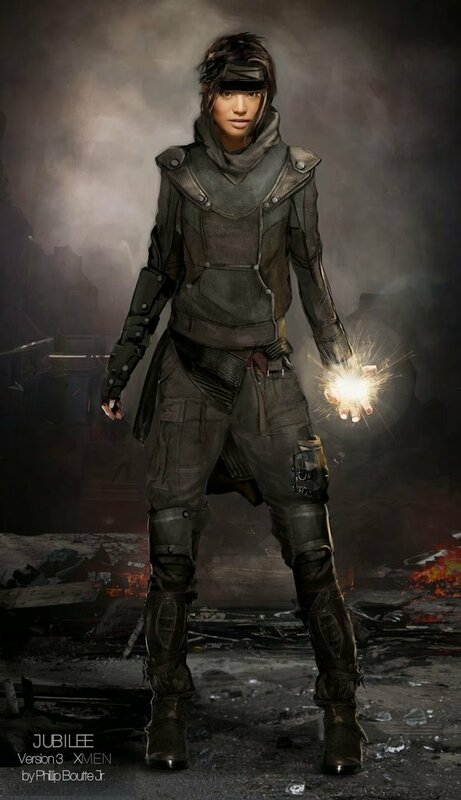 A half-Chinese orphan, she developed the ability to fire bursts of energy from her fingertips, similar to fireworks. It was not the most exciting ability, but the comics usually found a use for her in an arc here or there. In the most current run of comics, she's the mother to a baby boy, and she's also a vampire... because comics. But she's also gone on to become one of the most important contemporary X-Men and leaders of the team. It's worth checking out Phillip Boutte Jr.'s entire blog to see some alternate looks at the characters in X-Men: Days Of Future Past and wonder what could have been. There are alternate peeks at Magneto, Bishop and plenty others to peep. Don't worry, Jubilee. We could always see you again in X-Men: Apocalypse.